For a rider who suggested he might use the final grand tour of the year as preparation for the world championship Vicenzo Nibali spent the first week of the Vuelta as a somewhat reluctant race leader. The Shark had indicated that he felt he had a strong Astana team supporting him and that he was feeling good ahead of the race, but he was still adopting a ‘wait and see’ approach. Astana’s victory in the team time trial was still something of a surprise though. Radioshack and Omega Pharma were being marshalled by Fabian Cancellara and Tony Martin respectively. If the rumours are to be believed Cancellara is targeting both the road and TT world’s and he has been showing more of an interest in TT’s since returning to racing after the spring classics. With Astana winning the question was who would be donning the red leaders jersey. Anyone but Nibali was the answer, although a rider of his skill wouldn’t be seen obviously hitting the brakes to avoid crossing the line first. The first week has thrown up some stage wins that the neutral fan can enjoy. Leopold Konig leading wild card invitee’s Net App Endura almost snatched victory on stage two only to be overhauled in the closing metres by Katusha’s Dani Moreno. 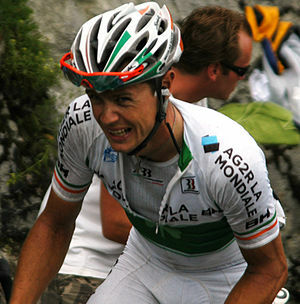 Moreno in turn was caught at the moment the final climb leveled out by Saxo Bank rider Nicolas Roche. Moving to Saxo from AG2R caused many people to question the motivation in this son of a grand tour winner. Roche has seemed happy riding in support of Alberto Contador at this years Tour and he appears to have come out of that race in better shape than Saxo’s nominal team leader for the Vuelta Roman Kreuziger. While Kreuziger hasn’t really started this week Roche has collected jersey’s as well as stage wins wearing the combined and KOM jerseys before taking the ultimate prize of the leaders red jersey ahead of today’s stage from Nibali. Nibali wished the leader was anyone but him earlier in the week. Chris Horner who took over the GC after winning stage 3 was upset to find himself handing the jersey back to Nibali after stage 4. Nibali’s response was that the Radioshack rider was “..welcome to it”. Horner’s win proved that he wasn’t the only ‘old man’ in Radioshack colours that could win a stage. * The sprint stages over the next three days were quiet for the GC but anything but for the viewers. Actually, that’s not entirely true; the stage 7 finish was good, stage 6 will live long in the memory. The curse of the rainbow jersey seems well settled on Philippe Gilbert’s shoulders and with this years championship imminent he remains without a win. He probably would have had one after staging a late break in the last few kilometres on Friday but for Zdenek Stybar his co-escapee. Stybar opportunistically set off in pursuit of Gilbert and after doing a few turns to ensure their break ‘stuck’ left the hard work to the world champion. As things stood the gap on the line was a tyre’s width and you were left with the sense that if Stybar had taken his turn Gilbert might have won. He was gracious in defeat, philosophical even and that elevates him in VCSE’s opinion. As exciting as Gilbert’s near miss was Tony Martin’s result the day before is probably the greatest 7th place pro cycling will ever see. Martin had set out to achieve a solo break on stage 6 as a very public training ride for the world TT championship. As the end of the stage approached his lead had fallen to a matter of seconds as the sprinters teams lined up to lead out their fast men. Then the lead was going back up; Martin riding between 65-70 KPH was average 5-10 KPH faster than the peloton. It was out of the seat stuff as Martin summoned his last reserves of energy to go for the line. It’s a bit of a cliche to say that riders should never look back and it’s more likely that Martin was already so far into the red that he didn’t have anything left to counter the onrushing sprinters. Of course, they were never going to pull up before the line and let Martin have the glory of what would have been one of the most incredible stage wins ever seen. Respect came later, for the riders like actual stage winner Michael Morkov there was their moment in the sun to enjoy first. Martin later revealed he received more messages of support, condolence.. whatever following this result than any of his world championships. Check it out for yourself at the bottom of this post. Konig, remember him? The Net App team leader had his revenge on Saturday. With a near 1000 metre ascent to the finish even Nibali struggled on the final climb of the stage. Net App had ‘done a Sky’ on the front of the bunch all day but it was a question of timing for Konig after his stage 2 attempt had been squashed by Moreno. The Katusha rider had a dig here too, but Konig had the legs to take a major win for his division two outfit to go with his last stage victory at this years Tour of California. Nibali’s difficulties handed the race lead to Roche and capped a week that even he would not have dared to dream about at the start of the race. With Kreuziger picked as leader following his strong showing at the Tour it’s clear it wasn’t part of Saxo’s plan either. Moreno keeps popping up though. Today’s stage with a uphill finish through town of the kind that Joaquim Rodriguez specialises in. With a gradient of 27% in places it was Moreno who powered ahead of his Katusha team leader and into the race lead as the race enters it’s second week. Added to his stage win earlier in the week Saxo might not be the only team switching priorities.